Architect Robert Venturi Dies At 93 A giant of postmodern architecture, he said he rejected unity, consistency and clarity: "All of those things made ... not for beautiful purity — but dead purity." 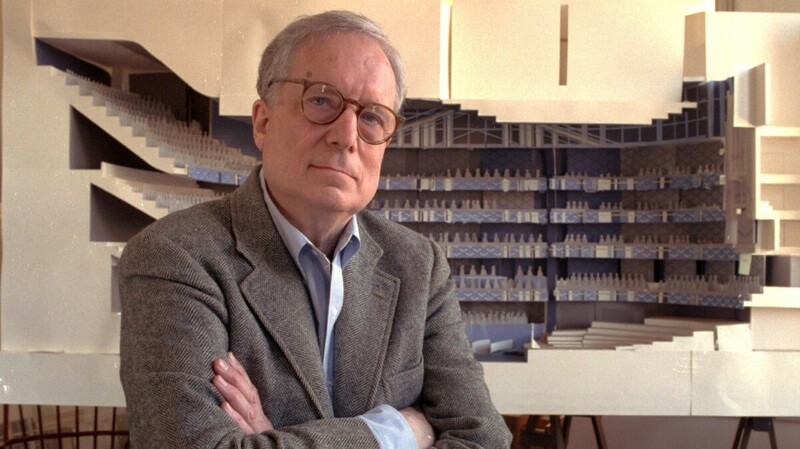 Robert Venturi poses in front of a model of a new hall for the Philadelphia Orchestra. He died on Tuesday. "Last night, Robert Venturi passed away peacefully at home after a brief illness. He's been surrounded by his wife and partner, Denise Scott Brown and his son, Jim Venturi. He was 93. The family is planning to have a memorial service to celebrate Venturi's life and this will be announced in the coming weeks." Venturi was born in Philadelphia in 1925, and studied architectural history at Princeton University. There, he garnered an appreciation for the styles of earlier architects that were ignored by the modernist movement, of which he was deeply critical. In a 1991 interview with Fresh Air, Venturi said that modernism "was simplicity, consistency, minimalism, strict rigidity, not the acceptance of contradiction. All of those things made ... not for beautiful purity — but dead purity." In 1991, Venturi was the recipient of the Pritzker Architecture Prize. Some of his most notable work includes the Vanna Venturi House, the Guild House and an addition to the Allen Memorial Art Museum. I swear I had more (better) photos of Robert Venturi's Fire Station #4 (1967) in Columbus, Indiana and sure enough I did! In addition to his significant works of architecture, Venturi was a prolific writer and critic. In his 1966 book Complexity and Contradiction in Architecture, Venturi advocated for "messy vitality over obvious unity," and for a "richness of meaning rather than clarity of meaning." The 1972 book Learning from Las Vegas, which was co-written with his wife Denise Scott Brown, is also often considered a defining text in the canon of architectural criticism. Brown is also a celebrated architect and writer. Vincent Acovino is a producer on NPR's Arts desk. An earlier version of this story misquoted Venturi, saying "richness and ambiguity over unity and clarity, contradiction and redundancy over harmony and simplicity." Venturi actually said "richness of meaning rather than clarity of meaning."